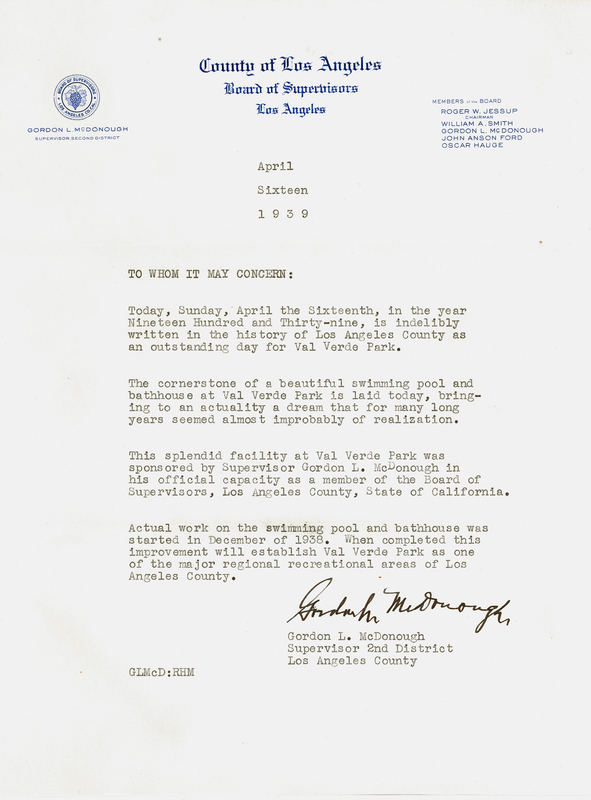 SCVHistory.com CP3903 | Val Verde | Letter from Supervisor Gordon McDonough on Poolhouse Cornerstone Laying, 4-16-1939. 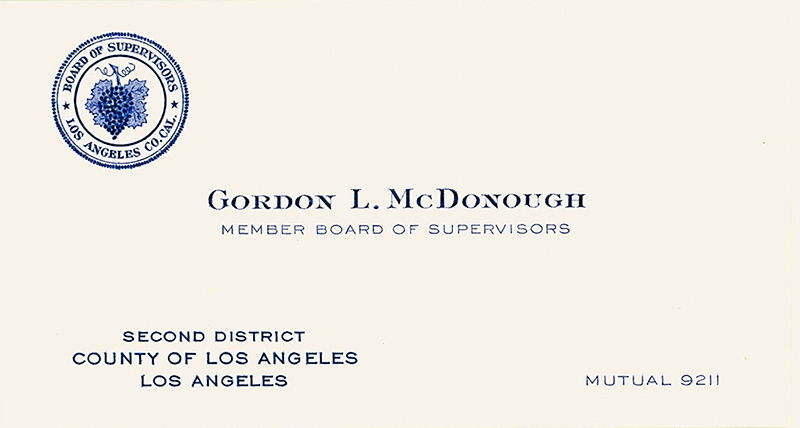 Letter (above) and business card (below) from Los Angeles County Supervisor Gordon L. McDonough on the occasion of the cornerstone laying ceremony for the Val Verde Park pool and bath house (community building) on April 16, 1939. McDonough is credited with having spearheaded the project. Born in Buffalo, N.Y., and raised in Pennsylvania, McDonough (1895-1968) served on the Board of Supervisors from 1933-1944. In the latter year McDonough, a Republican, was elected to Congress, where he served from 1945-1963. This letter, envelope and business card were entombed in the time capsule that was secreted inside the cornerstone of the Val Verde Park poolhouse in 1939. The Los Angeles County Parks Department opened the capsule in 1994 during a renovation project and photographed the contents circa 2014. Today, Sunday, April the Sixteenth, in the year Nineteen Hundred and Thirty-nine, is indelibly written in the history of Los Angeles County as an outstanding day for Val Verde Park. The cornerstone of a beautiful swimming pool and bathhouse at Val Verde Park is laid today, bringing to an actuality a dream that for many long years seemed almost improbably of realization. This splendid facility at Val Verde Park was sponsored by Supervisor Gordon L. McDonough in his official capacity as a member of the Board of Supervisors, Los Angeles County, State of California. Actual work on the swimming pool and bathhouse was started in December of 1938. When completed this improvement will establish Val Verde Park as one of the major regional recreational areas of Los Angeles County. CP3903: 9600 dpi jpeg from original materials on file with the L.A. County Department of Parks and Recreation.